A UK based human rights group is up in arms trying to prevent a shipment of 1.6 million tear gas canisters to Bahrain to protect civilians, Ahmed Ali from Bahrain Watch has told RT. RT:Why do you think the Bahrain government could be placing an order for vast quantities of tear gas? RT:So the fact that they are ordering more, does that suggest that they are trying to contain the protests? More protests are on their way, is that what they’re anticipating? AA: What we recovered is a tender document of a proposed shipment of 1.6 million tear gas canisters. And what we believe is that no shipment has been made yet. 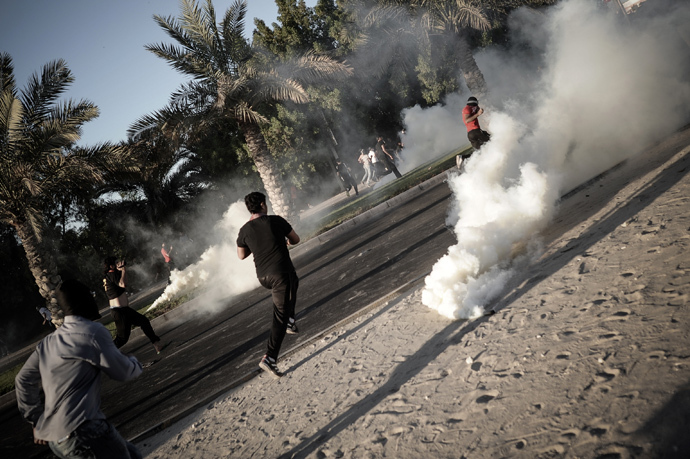 It is at the process of licensing approvals from the authorities, so the campaign that we’ve unleashed at the moment is trying to prevent that shipment from reaching Bahrain to prevent tear gas from being used against civilians. RT:You’re in the UK. 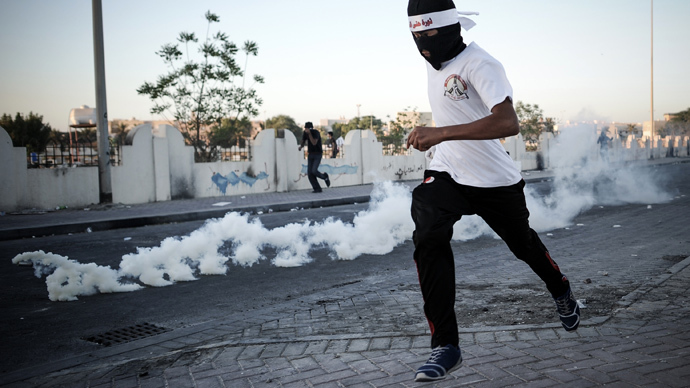 How could you stop those tear canisters getting to Bahrain? AA: The campaign that we have set up is called ‘Stop the Shipment’. It’s based on previous campaigns that we’ve witnessed. And we have set up a website with a template email. It is a global campaign where people can send emails to these manufacturers and these export officials. We’ve noticed similar trends in other countries such as Turkey where thousands and thousands of emails were sent to these manufacturers and public pressure can cause the authorities to shift their decisions, to prevent this tear gas shipment from reaching Bahrain. RT:What is your overall aim here, the human rights group? Are you also in favor of toppling the Bahraini government there? If so will that really stop the human rights issues ongoing, bearing in mind what we’ve seen in countries such as Libya and Egypt where the governments have toppled and the situation there turned out to be chaotic and not good for human rights? AA: Bahrain Watch is an independent, non-political group. What we have been concentrating on is arms exports and surveillance technologies and the reformation process undergoing in Bahrain. Whether or not the regime will be toppled or will remain is not for Bahrain Watch to answer. RT:What sort of political pressure are you as a group putting on the UK government now? AA: We’re trying to lobby Parliament here in the UK and we’ve had a successful protest organized last week in front of the S. Korean embassy because we believe that one of their manufacturers is the number one supplier of tear gas in Bahrain. There is also a protest organized on Friday morning outside the Korean embassy. We have not yet received a response from Bahrain directly in regards to this shipment yet, which points to the notion that there is in fact a shipment going through and they are trying to ignore it, so public pressure fades away. We have had successes. Over 30 thousand emails have been sent to these manufacturers. And we had the Korean Federation of Trade Unions send a letter directly to the Korean officials asking them to prevent this shipment from reaching Bahrain.